You are currently browsing articles tagged tatton flower show 2012. 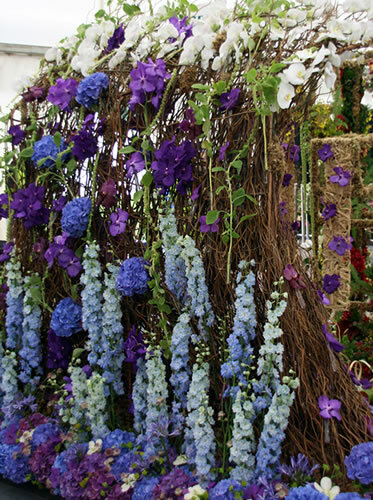 All these displays were housed in the Floral Design Studio at Tatton Flower Show. 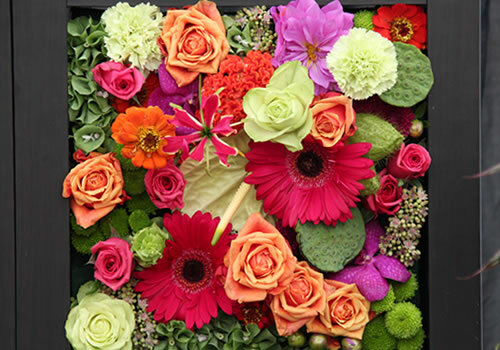 The hub for all things floristry related, exhibits, competitions, demonstrations and workshops. Several colleges took part in the first specific College Competition at Tatton which I blogged about on Saturday. Young florists took part in the WorldSkills competitions, which I’ll feature soon. The displays above are from local florist The Black Rose, based in Knutsford and Hale. The Black Rose has exhibited at Tatton for many years and always does a fantastic display. This year’s designs featured their trademark contemporary style using a white theme. 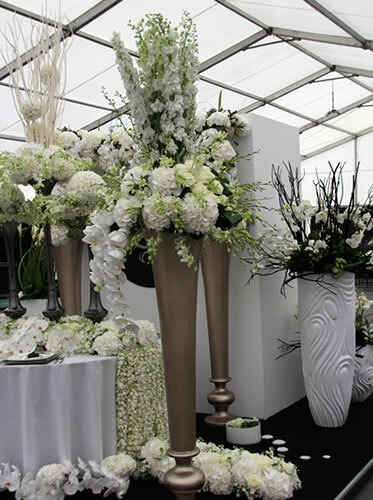 These fabulous 5ft tall vases hold arrangements of hydrangeas, delphiniums and Singapore orchids. The stunning floral table runner features roses, hydrangeas, stocks, orchids, and chrysanthemum blooms. 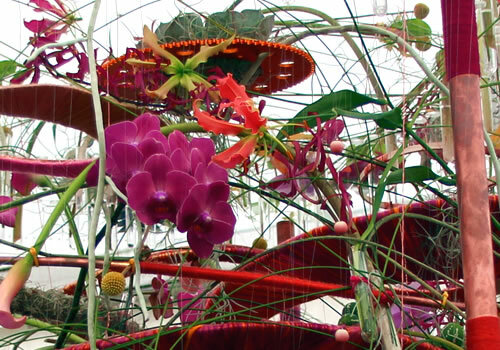 The garlands that trail down the sides of the table are made from Singapore orchids. Reaseheath College from Nantwich used very vibrant colours in their display. They used cerise, lime, purple and orange set against black display stands. They cleverly filled storage units from a well-known Swedish furniture shop with flowers too. 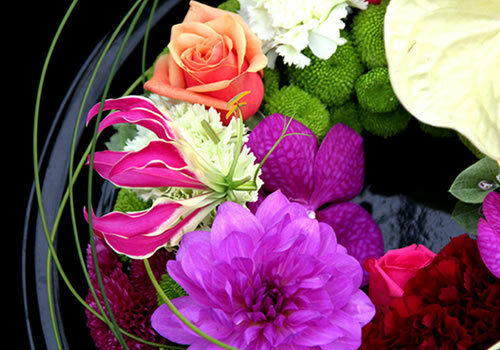 This circular design features gloriosa, roses, orchids, chrysanths, carnations and anthuriums, with loops of flexi grass. 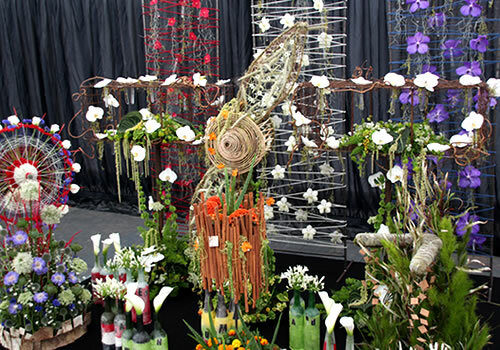 Manchester based florist Verdure produced an impressive display based on Plato’s Atlantis. 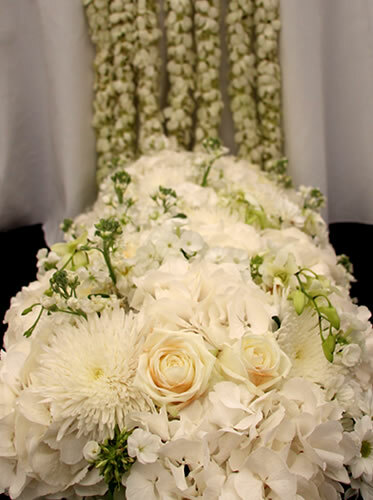 The huge wave was constructed out of willow branches and adorned with fresh flowers. 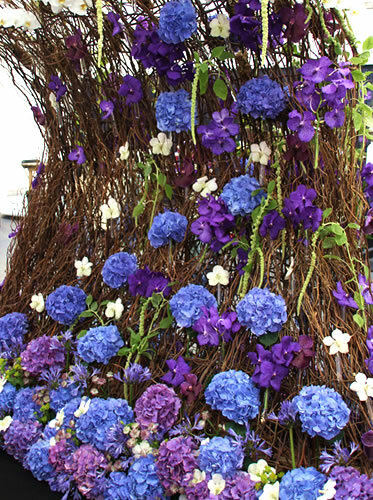 They used hydrangeas, delphiniums, vanda orchids, and amaranthus in shades of blues and purples, with white phalaenopsis orchids at the crest of the wave. This year there is a special competition for colleges, with the theme Flights of Fancy. This links in with Tatton Park’s Art Biennial theme. The colleges were given a space of 2m x 2.5m to work within. The award for best exhibit was given to Askham Bryan College, for their stunning design ‘The Sun’. They also achieved a Silver-Gilt medal. Their designs featured a frame of copper pipes holding perspex rings and rings covered in coloured wool. 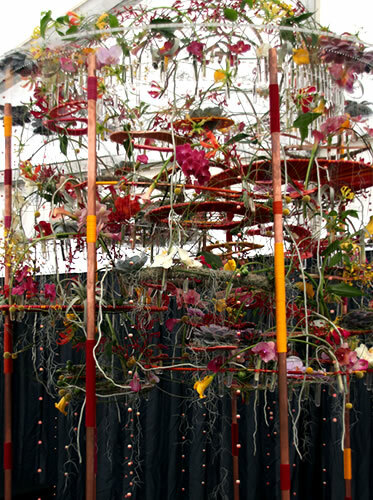 Hundreds of test tubes held flower in shades of red, oranges and yellows including phalaenopis orchids, gloriosa, calla lilies, oncidium orchids, craspedia, and echivaria. Strands of threaded hypericum berries hung around the design. Bishop Burton College gained a Bronze Grenfell medal for their design, ‘The Flight of Amy Johnson’. They used flowers to represent places that Amy travelled to on her pioneering flights in the 1930s, including England, Australia and India. 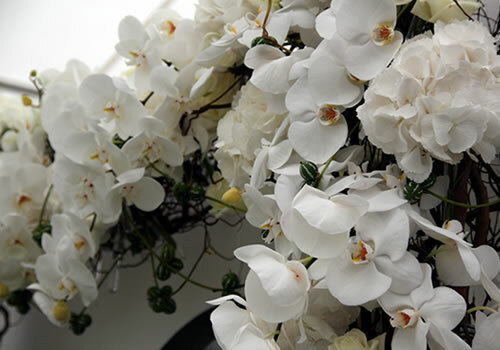 They used orchids, scabious, celosia, calla lilies, agapanthus, echinops, alliums, anthuriums, cinnamon sticks and aloe vera plants. Water meadows and flights of floral ‘birds’ were the inspiration behind East Surrey College’s design, they were awarded a Silver Grenfell medal. They used frames woven with textiles and test tubes to hold materials in place. 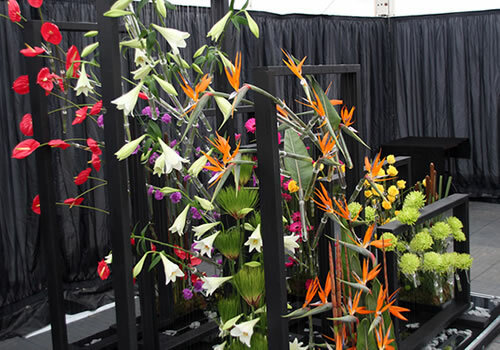 Their design featured strelitzia, longiflorum lilies, anthuriums, roses, chrysanthemums, snake grass and gerberas. This garden has a local story behind it. Caldwell’s of Knutsford was one of the oldest nurseries in the North of England, it traded from the 1780s to 1991. 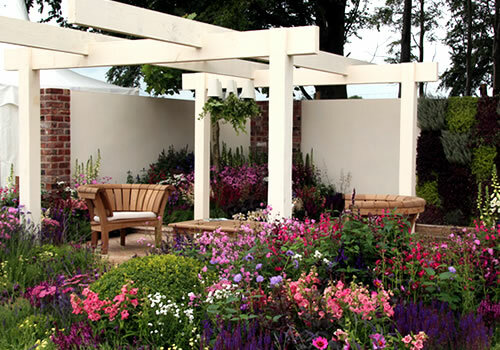 It has an important history supplying some of the country’s finest gardens, including Tatton Park. The Cheshire Gardens Trust has started a project to transcribe seventeen ledgers from Caldwell’s that survive today. They contain vast amounts of information on customers, changes in plant fashion, worker’s wages, methods of transport and prices. One of Caldwell’s first customers was John Wedgwood, who co-founded what is now known as the RHS. The garden was designed by Jacquetta Menzies and made by volunteers from the Cheshire Gardens Trust and WAP & Son. The design is corner of a larger garden in a coastal setting, based on the golden ratio, a proportion found in nature. The golden ratio was often featured in gardens during the 18th Century when Caldwell’s Nursery was established. 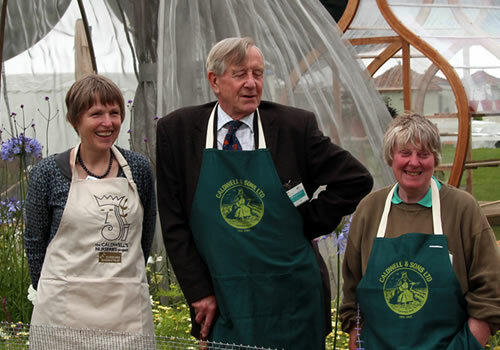 The garden is inspired by King Canute, the nurseries logo. The spiral path represents the swirling sea of Canute’s legend, with the rectangular windbreak symbolising the work of Cheshire Garden’s Trust, which aims to capture the receding tide of history and memories. 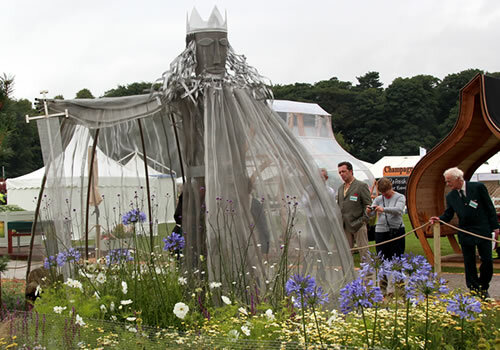 Christine Wilcox-Baker designed the ethereal sculpture of the ancient king which presides over the garden. The sheltering figure contrasts with an open contemporary area. 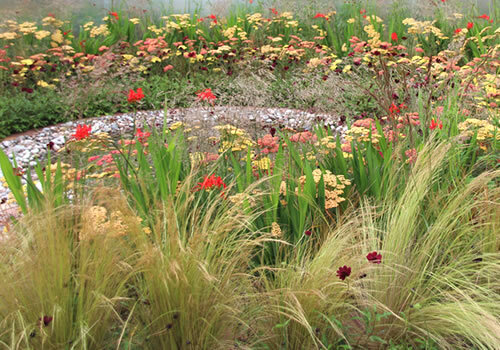 The planting on the enclosed bank is inspired by the Irish Sea coast. Delicate flowers and grasses in blues, whites and silvers provide a soft flowing movement in the centre. A full plant list can be found on The Cheshire Gardens Trust website. 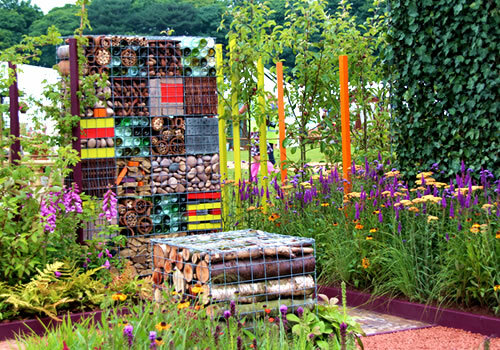 I featured The Mornflake Garden on my blog on Tuesday, it won the award for best Show Garden. 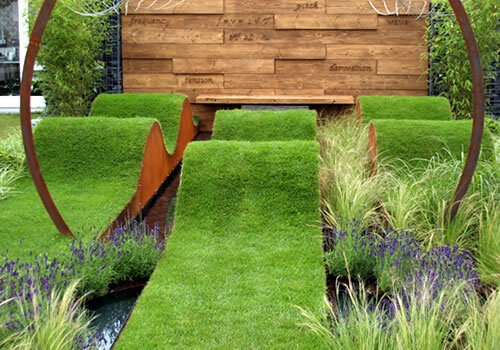 I’ve included a two of my favourite Show Gardens in today’s blog. The full list of medals is available at the bottom of the page. The garden above is Remount sponsored by Brett Landscaping and Gaze Burvill. It was designed by Stephen Dennis and Platinum Gardens. The garden was awarded a silver-gilt medal. The design features an old barn, which has been turned into a modern space. The beautiful planting in pinks and blues complements and softens the paving. This garden is aptly named Nature Squared. 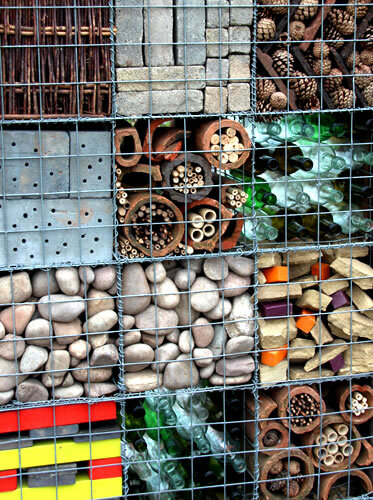 I love the gabion wall filled with textured materials to create lots of nooks and crannies for crawly creatures. 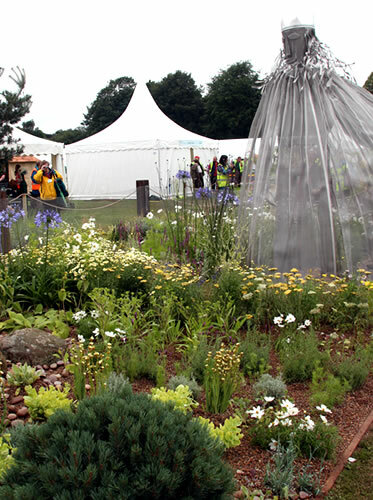 The garden was designed and made by students at Reaseheath College in Nantwich and sponsered by Trentham Gardens. It has clipped vertical structures and geometric shapes, which have created multiple habitat niches to encourage native wildlife. The the vibrant herbaceous planting helps attract pollinating insects. 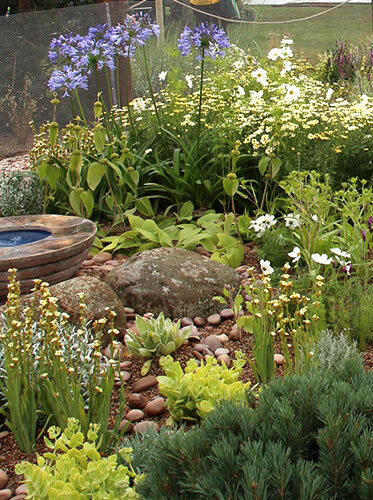 The garden shows how it is possible to have contemporary design whilst encouraging biodiversity. The brief for the Orchestra Gardens was to create a design that represents a section of an Orchestra. It is a new category for 2012 and is sponsored by the RHS. The designers took inspiration from their chosen orchestral section and created designs that show the elegance of strings, the pulsating beat of drums and the swell of brass. 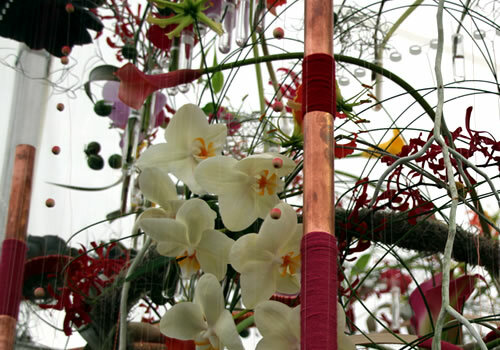 The garden above is ‘The Science of Strings’, it was awarded a gold medal. The designers are Brendan Vaughan and Leon Davis, their garden is inspired by the science behind the sound of string instruments. 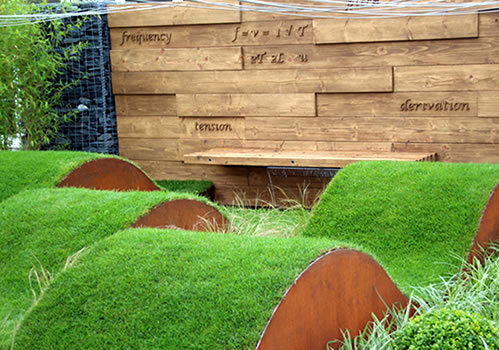 The main feature is the undulating lawns which represent sound waves. The steel wires attached to an archway depict how different sounds are made by altering the tension of the string. 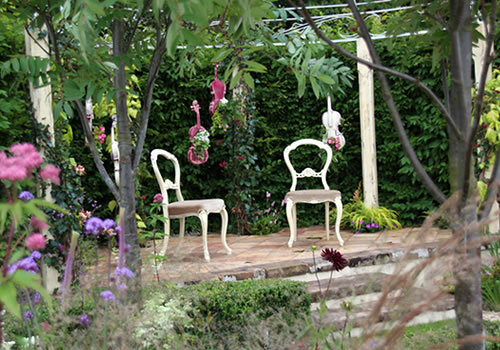 This next garden won Best Orchestra Garden and a gold medal. Owen Morgan designed ‘To The Beat, it is inspired by the sound of a drum, it’s feeling and intensity. The circles of planting mirror the waves that radiate from the centre of the pool. 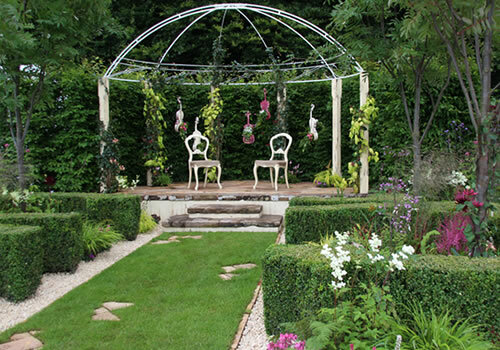 This elegant garden is called ‘Air on a Green String’; it was designed by Alexandra Froggatt. It is inspired by string instruments and features box topiary in the shape of a violin’s f-sound hole and part buried violins and cellos.